17.1 They Fall Before Us! 20.1 The Time Is Now! Bards gain a +2 class bonus to Dexterity or Charisma, as long as it isn’t the same ability you increase with your +2 racial bonus. Possible backgrounds include: wandering minstrel, cathedral musician, court jester, mercenary, tavern owner, failed hedge wizard, diplomat, spy, royal taster, caravan guide, smuggler, and battle skald. At 1st level, bards start with non-magical musical instruments, a melee and ranged weapon of their choice, some form of light armor, and any other minor elements of gear their backgrounds suggest. Bards may start with either 25 gp or 1d6 x 10 gp. As a bard advances in level, they have three different types of powers to choose in combat: bardic songs, battle cries, and spells. Bardic songs last for one or more rounds and end with a final verse that carries a big payoff. Although magical, bardic songs don’t count as spells; they don’t force the bard to suffer opportunity attacks from engaged enemies, and they can’t be canceled by effects that can cancel spells. In fact, bards can cast spells while in the middle of singing a bardic song. Each song specifies what type of action starts it. To sustain it during the next round, it requires an action and a d20 check against its sustain target. If successful, the song can continue with its sustained effect for that round. (The next round will require another sustain check.) If your attempt to sustain a song fails, the song’s final verse effect resolves immediately, and then the song’s power ends. You can start another song on your next round. You don’t have to try to sustain the song at the start of your turn. If you choose not to sustain a song, its effects end immediately and you choose whether to use the song’s final verse effect in the current round or to start a new song. You can’t do both. Some songs have an immediate effect that happens each time you start or sustain the song. Others have effects that continue throughout the entire round. Most songs stop when a bard is knocked unconscious, silenced, or stunned. Having your song stopped this way prevents you from getting the final verse effect. You can only sing one bardic song at a time. If you are singing a song (or spend an action to try to sustain a song), you can’t start another song that round. Bardic songs are loud, and cancel any of stealth effects you may have. Adventurer Feat Your bardic songs don’t stop immediately when you are knocked unconscious, stunned, or silenced. Instead, they continue for one round, giving you the chance to sustain the song on your next turn. Bards use battle cries to encourage, inspire, warn, and magically aid their allies. Battle cries are triggered by flexible melee attacks. The bard makes a melee attack and is able to use a battle cry that corresponds to the attack’s natural result, sometimes whether or not the attack hits. Bonuses provided by battle cries can help a bard’s allies but not the bard. Adventurer Feat You can generate the effect of any 1st or 3rd level battle cry you know as a standard action (instead of making a flexible melee attack to see which battle cry you are able to trigger). This allows you to choose the particular battle cry you want, at the expense of taking your standard action. Bards use arcane spells that function like those of other spell-casting classes. Some spells are daily, some recharge, and others are at-will. Unlike most character classes, bards use two different ability scores for their attacks. 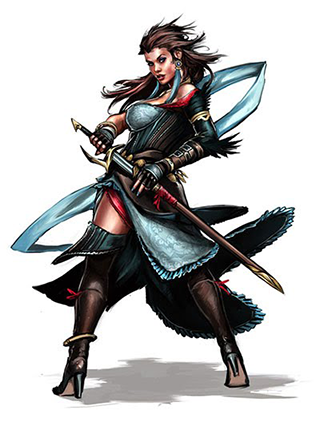 Their melee and ranged weapon attacks use Strength or Dexterity, while their spells use Charisma. At each level, including 1st level, you may learn a great ballad of your choice. Each day you can sing one of these songs to give you a positive relationship with an icon that you would not ordinarily have as well as increasing a negative relationship with another icon. Song choices for the great ballad are up to the role-player. It takes at least a few rounds to sing a great ballad, so ideally it happens outside of combat. As you sing the ballad, it’s an opportunity to tell the GM what’s special about the story you are telling. You can use these points to roll relationship dice the way you roll your normal icon relationships (see Icon Relationships). If you already have positive or conflicted dice with the icon you’ve sung about, add them to your new bonus dice. If you have negative dice with the icon you’ve sung a ballad to, they can be temporarily overruled by the ballad, but the GM should feel free to interpret any 5s rolled with a heavy hand. When your great ballad magically compliments an icon, another icon should take a hit. As you explain the story of your ballad to the GM, you should account for at least one icon who is being mocked, vilified, or referred to in unflattering terms. You get an equal number of cursed dice for that icon. Cursed dice aren’t like negative relationship dice—they never help you. At the GM’s option, you’ll have to roll these cursed dice at least once and interpret them as possible problems for you: rolls of 1 are a definite problem; rolls of 2 mean there are story complications connected to the temporary enemy icon. Adventurer Feat The first time you use your ballad-created relationship, any 5s you roll become 6s. You also gain a +2 bonus to your Balladeer checks. Champion Feat You can sing two great songs a day. You can’t sing positively about an icon that you’ve already sung about as an enemy earlier in the day. Epic Feat If you are willing to gain an equal number of cursed relationship dice with all of the listed enemies for a song, increase the positive bonus dice you gain from a successful ballad to 3 or 4. You cannot take this talent if you have taken the Spellsinger talent. Increase the number of battle cries you know by one. The bonus battle cry can be from your highest possible level. Adventurer Feat One battle per day, you can use your battle cries to help yourself. Champion Feat When you use a battle cry on yourself, it also helps an ally. Epic Feat Once per battle, reroll an attack that was meant to trigger a battle cry but didn’t. Choose another spell-casting character class. You can choose one spell from the spell list (but not the talent list) of that class, of your own level or lower, as an extra spell you know how to cast. You can even take its feats up to your tier, if it has any. You may only choose from the spell list—not from talents. This spell is a bonus spell, not included in your bard class count. Adventurer Feat You can use your Charisma as the ability score that provides spell’s attack bonus and damage bonus (if any). Other ability score references remain unchanged. If the spell is a wizard spell, you also gain three cantrips of your choice from the wizard. You can cast them like a wizard who lacks the Cantrip Mastery talent. If you choose a spell from the sorcerer class, you also gain the sorcerer’s dancing lights class feature. Champion Feat Choose a second spell-casting class. Choose another spell from that class as well. Epic Feat Choose a third spell-casting class. Gain a spell from that class also. You cannot take this talent if you have taken the Mythkenner talent. Your bardic skills and magic are now based on your Intelligence rather than Charisma. Any time an element of the bard class refers to Charisma, you can replace that element with a reference to Intelligence. Take two additional points of backgrounds. You can use these additional points to raise a background that has something to do with history, bardic lore, or magical knowledge up to the usually impossible rating of +6. Take a single point of relationship with an icon. Add the point to a relationship you already have up to your normal maximum, or start a new one—positive, conflicted, or negative. You cannot take this talent if you have taken the Loremaster talent. Your bardic skills and magic are now based on your Wisdom rather than Charisma. Any time an element of the bard class refers to Charisma, you can replace that element with a reference to Wisdom. Take two additional points of backgrounds; you can use these additional points to raise a background that has something to do with religion, mythology, or history up to the usually impossible rating of +6. When you attempt to maintain a bardic song, if you describe it in a fashion that entertains the GM, or at least a couple of the players, you get a bonus of +1 to +3 to maintain the song. This talent is for those that enjoy improvisation. You cannot take this talent if you have taken the Battle Skald talent. You can choose an extra bardic song or bard spell at the highest level you know. Once per scene when one of your allies rolls relationship dice for an icon, you can roleplay a one or two sentence story (usually related to the icon, but perhaps otherwise pivotal) that allows them to reroll the relationship check if they don’t like the first result. One of your engaged allies can make a disengage check as a free action. Adventurer Feat The disengage check gains a +2 bonus. Champion Feat The bonus increases to +5. Epic Feat An engaged ally you target with this battle cry can pop free from one enemy as a free action before making the disengage check. Effect: One nearby ally can heal using a recovery. Adventurer Feat The target adds +1d4 healing per point on the escalation die. Champion Feat The attack can now also trigger on any natural even roll; the extra healing is now +1d6 per point. Epic Feat You can use pull it together three times per battle; the extra healing is now +1d10 per point. Effect: Give a nearby ally a +2 bonus to AC until the start of your next turn. Adventurer Feat Bonus also applies to PD. Champion Feat Bonus also applies to MD. Epic Feat Bonus increases to +4. Effect: A nearby conscious ally can roll a save against a save ends effect. Adventurer Feat The save gains a +1 bonus. Champion Feat The bonus increases to +2. Epic Feat If the escalation die is 3+, two nearby conscious allies (instead of one) can each roll a save (with bonuses). Opening & Sustained Effect: You and your nearby allies gain a +1 attack bonus until the start of your next turn. Final Verse: The effect ends immediately, but one ally of your choice gains a +2 bonus to their next attack roll this battle. 3rd level song: The effect also provides a +1 bonus to saves. 5th level song: Sustain the song on a 9+. 7th level song: Recharge check is now 6+. 9th level song: The effect also provides a +1 bonus to Mental Defense. Opening & Sustained Effect: Any attack against you takes a penalty equal to the number of your allies in the battle who have more hit points than you. Final Verse: The effect ends immediately, and you or one ally of your choice can heal using a recovery. 3rd level song: Sustain the song on a 4+. 5th level song: Add +5 hp to the recovery. 7th level song: Add +10 hp to the recovery. 9th level song: Add +15 hp to the recovery. Special: When you use battle chant, you can choose any battle cry effect you know as if you were making a basic melee attack, with the battle chant attack roll taking the place of the basic melee attack roll. Hit: 1d4 + Charisma thunder damage. 3rd level spell: 2d4 damage. 5th level spell: 4d4 damage. 7th level spell: 6d4 damage. 9th level spell: 10d4 damage. Adventurer Feat Your battle chant damage dice are now d6s instead of d4s. Champion Feat Once per day, you can expend one of your recoveries to reroll a battle chant attack roll. Epic Feat One battle per day, your battle chant damage dice become d10s. Hit: The target is confused until the end of your next turn. Natural Even Miss: The target is dazed until the end of your next turn. 3rd level spell: Target with 64 hp or fewer. 5th level spell: Target with 96 hp or fewer. 7th level spell: Target with 160 hp or fewer. 9th level spell: Target with 266 hp or fewer. Adventurer Feat Recharge check is now 6+. Champion Feat The target of the spell doesn’t have to be nearby, just in line of sight. Epic Feat On a hit, the confusion effect is now save ends. Special: This spell cannot be cast during combat or on a target that has rolled initiative to fight. Special: On a miss, the spell is not detectable by most others unless you miss by 4+ or roll a natural 1, in which case the target and its allies knows what you tried to do and will usually be angry about it. Hit: 5d6 + Charisma thunder damage, and the target is dazed until end of your next turn. Miss: Half damage, and deal thunder damage equal to your level to each of your allies engaged with the target. 3rd level spell: 6d8 damage. 5th level spell: 8d10 damage. 7th level spell: 2d6 x 10 damage. 9th level spell: 3d6 x 10 damage. Adventurer Feat On a natural even hit, the dazed effect is now save ends. Champion Feat The spell is now recharge 16+ after battle instead of daily. Epic Feat You can now target 1d4 + 1 enemies in a group with the spell. Effect: Give a nearby ally temporary hit points equal to your Charisma modifier. Adventurer Feat If the ally is staggered, double the temporary hit points. Champion Feat Add your level to the temporary hit points given (add before any doubling). Epic Feat You can choose yourself instead of an ally as the target of the battle cry. Effect: This battle, your next ally to attack the target you missed gains a +2 attack bonus with that attack. Adventurer Feat That ally’s attack also deals +1d6 damage. Champion Feat The damage bonus increases to +3d6. Epic Feat The damage bonus increases to +3d12. Effect: Choose a nearby ally. That ally can either roll a save against a save ends effect or roll a normal save against a condition that has a duration that lasts until the end or beginning of a turn. Opening & Sustained Effect: You or a nearby ally gains 3d6 temporary hit points. Final Verse: One target that gained temporary hit points can also heal using a recovery. 5th level song: 5d6 temporary hit points; sustain the song on a 9+. 7th level song: 7d6 temporary hit points, and the recovery from the final verse is free. 9th level song: 9d8 temporary hit points; sustain the song on a 7+. Opening & Sustained Effect: Make the following attack against 1d4 + 1 nearby enemies. Hit: 5d6 + Charisma thunder damage. Final Verse: Make the attack again, but this time it deals half damage on a miss. 5th level song: 7d6 damage. 7th level song: 9d8 damage. 9th level song: 10d12 damage. Champion Feat The number of targets increases to 2d4. Epic Feat Two of the targets can now be far away instead of nearby. Hit: 6d6 + Charisma psychic damage, and until the end of your next turn, when the target misses with one of its attacks, it takes half the damage its attack would have dealt. 5th level spell: 9d6 damage. 7th level spell: 10d8 damage. 9th level spell: 2d8 x 10 damage. Adventurer Feat On a hit, the effect that damages the target when it misses is now save ends. Champion Feat Recharge check is now 6+. Epic Feat A natural even miss does not expend the spell. Targets: Two random nearby allies. Choose the targets randomly from all nearby allies (including you) who are damaged. Effect: Each target can heal using a recovery. 5th level spell: Add +5 hp to the recovery. 7th level spell: Add +15 hp to the recovery. 9th level spell: Add +25 hp to the recovery. Adventurer Feat The spell is now recharge 16+ after battle instead of daily. Champion Feat Add a third random target. Epic Feat The recoveries the targets use are now free. Effect: A nearby ally regains the use of a once-per-battle racial ability that was expended this battle. Effect: A nearby ally can heal using a recovery, and three nearby allies gain a +3d6 damage bonus to their next damage roll this battle. Champion Feat The battle cry can now trigger when the escalation die is 3+ instead of 5+. Epic Feat The damage bonus is now +3d12. Opening & Sustained Effect: Until the start of your next turn, you and your nearby allies who cast spells that are normally expended by being cast can roll a d20 after casting the spell. On a 16+, the spell is not expended. Final Verse: All spells you and your allies cast before the start of your next turn gain a +2 attack bonus. 7th level song: Gain a bonus to song of magic’s sustain check equal to the escalation die. 9th level song: Rolls to retain expended spells gain a bonus equal to the escalation die. Hit: 8d8 + Charisma psychic damage + Xd6 bonus damage, where X = escalation die. Miss: Xd6 psychic damage, where X = escalation die. 7th level spell: 10d10 damage. 9th level spell: 2d10 x 10 damage. Champion Feat Recharge check is now 11+. Epic Feat Bonus dice and miss dice are now d12s. Hit: The target is confused until it rolls two successful saves. 7th level spell: Target with 140 hp or fewer. 9th level spell: Target with 240 hp or fewer. Special: You can use this battle cry only on your turn. Effect: A nearby ally can make a basic attack as a free action. Epic Feat The battle cry can now trigger on a natural 19+. Opening & Sustained Effect: Each nearby ally who hits at least one enemy with an attack during their turn can heal using a recovery. Final Verse: One nearby ally can make a basic attack as a free action and heal using a recovery if the attack hits at least one target. 9th level song: The recovery granted by the final verse attack is free. Opening & Sustained Effect: Each nearby enemy that has fewer hit points than you is dazed until the end of your next turn. Final Verse: Each nearby enemy takes 5d6 + Charisma psychic damage. 9th level song: 7d6 damage. Effect: You can swap your position and the positions of all your nearby allies, even if you can’t see them when you cast the spell. Each position presently occupied by you or an ally must end up occupied after the swap, but otherwise you can swap freely. Epic Feat You can now also swap the positions of far-away allies you can see, up to a maximum of 9 creatures. Effect: Choose one nearby ally. That ally can expend a recovery to regain a daily power or spell. Epic Feat The battle cry can now trigger on natural 18+. Opening & Sustained Effect: Later this turn, you can add 1 to the natural result of one ally’s d20 roll. Then, afterwards, you can subtract 1 from the natural result of an enemy’s d20 roll. Final Verse: The GM chooses an icon relevant to the situation; you choose the PC who will make an icon relationship check. That player makes the check and joins the GM in a duet of improvisation as to how the icon relationship roll has some impact on the current battle. Special: Escalation die must be 4+. Effect: Each target can roll a d20 for each of its expended daily, recharge, and per battle powers and spells other than inspire legends. If the roll is 11+, the character regains the use of that power or spell.